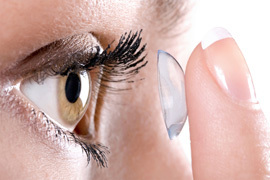 There are many different types and brands of contact lenses. Dr. Deol can help you determine which type of contact lens is right for you. The risk of infection is another disadvantage of contact use. Excessive wear of the lenses, particularly overnight wear, is associated with many safety concerns, and could lead to infections in the eyelid, conjunctiva, and cornea. Bacterial infection resulting from improper cleaning of lenses should also be a considered risk. Be sure Dr. Deol reviews proper care for your contacts at the time of your appointment.